One of area of sales focus must be to deepen relationships with evangelists. These people refer business to you and they will refer more. This video and the accompanying transcript will help you focus on the five ways to accomplish this goal. Our focus is on developing and deepening evangelist relationships. Evangelists are the most important people in the world to you because they refer you business, they promote you and your business, and they help you deepen relationships with your clients. Your goal is to focus on finding as many evangelists as possible and deepening those relationships over time. Here are five ways to deepen relationships with evangelists. The first thing you need to do, the absolute foundation is, number one, do great work. That’s the price of entry, if you want to get business from somebody else, particularly someone who is connected to dozens, if not hundreds, of people and can promote you and the service you provide and the business you provide. You have to do exceptional, remarkable work. You have to be known as somebody who’s the best in your field. That’s the first thing you need to do. You need to make sure that the evangelist knows that the quality of your work is far superior to your competitors. Number two is develop a personal relationship with the evangelist. What are his or her personal goals? What’s important to him? What’s important to her? What does she want to accomplish in her personal life? Why is this important? Because we’re people. You have to treat the person holistically. You’re not just in a business relationship with them. You’re in a personal relationship with them. How can you help them achieve their personal goals? What’s their spouse’s name? What are their kids’ names? What are their kids interested in? You have to be able to engage in conversation with them at that level. Enter all of this information into your database, so you know what you’re going to talk about with the evangelist before you meet with him or her. You know when you’re going to send him or her a gift what you should give them to promote their personal goals or to engage them personally. Developing a personal relationship is critical to the success of any evangelist relationship over time. The third thing you need to be able to do, the third thing that’s essential in developing and deepening relationships with evangelists is putting, money in their pocket. You have to refer them if you want them to refer you. They may not be in the same line of business you’re in. They might be into something that’s completely different and not related to you and what you do. You have to find someone you can connect them to to help promote their business, so that they can make more money, or you have to send them clients directly. We all, if we really push ourselves, can connect evangelists with people who can do business with them, and that’s what you have to do. You’ve got to put some money in their pocket. They’re helping put food on your table. They’re helping put money in your pocket. You’ve got to do the same for them. You’ve got to promote them. If you’re doing an event, invite them to speak at your event. If you’re writing an article, invite them to coauthor the article with you. Joint venture marketing with evangelists is a super way to deepen relationships. Promote them as much as possible. You’ll notice, when I do a speaking engagement or even in some of these videos, I talk about people who I think you can use to help you grow your business. Those people are evangelists for me, and I’m promoting them to you. You need to do the same for people who are evangelists for you. Promote them every chance you get. Have their business cards with you wherever you go and hand their business cards out. The fifth thing you need to do in order to promote your relationship with an evangelist is communicate with them frequently. You got to let them know where the relationship stands between you and the client they referred to you. You have to let them know what’s new in your industry. You have to let them know what’s new in your company, and you have to let them know what’s new in the relationships they’ve helped you develop. Communication is critical. An evangelist should never, ever be surprised by something that went on in the client relationship, particularly when they referred the client to you. Evangelists are an important part of The 60 Second Sale process. You can find this process laid out in great detail in the book of the same name. Number one: Do remarkable work. Number two: Develop a personal relationship with them. Number three: Put money in their pocket. Number five: Communicate with them frequently. 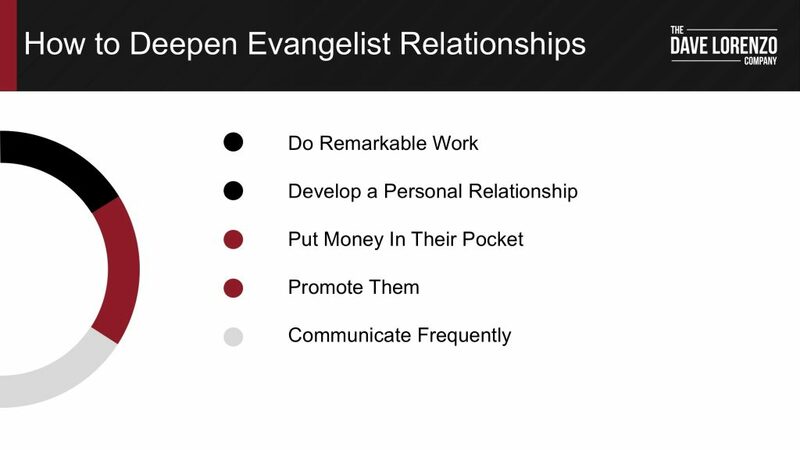 These are the keys to success in developing and deepening relationships with evangelists. Follow them, and your business will explode.